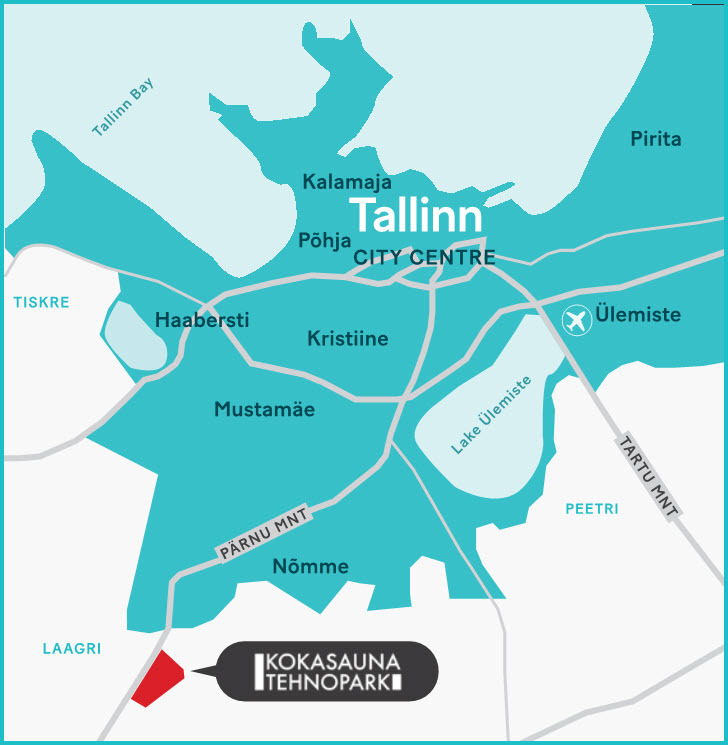 Kokasauna industrial park is located just behind the border of Tallinn in the immediate vicinity of the well-established Tänassilma industrial and logistics park and is suitable for all companies looking for new production, storage or other commercial premises. Tänassilma region has proven itself for companies already operating in the area as an effective business environment, where also future growth and development is possible. Kokasauna industrial park is suitable for companies that value well thought-out planning and infrastructure solutions, good transportation connections, the proximity of labour force from both Tallinn and nearby Saku and Saue municipalities, and good neighbours and partners in the form of companies operating in the area. The immovables are located approximately 1 km from the border of Tallinn, 4 km from the Tallinn Ring Road (E265), 0.3 km from the Pärnu Highway (E67), 14 km from Tallinn City Centre, 40 km from Muuga Harbour and 16 km from Tallinn Airport and the Port of Tallinn. Among the companies operating in Tänassilmas are the following: in the field of production Stoneridge Electronics AS, LEAB Eesti OÜ, Itella Smartpost terminal, R-Kiosk Estonia AS, Neiseri Grupp AS, Baltic Disc AS, Stora Enso Packaging AS, Baltic Laundry Service OÜ, Pussikeskus Eesti OÜ, NeoQi AS, Karl Storz Video Endoscopy Estonia OÜ, Silberauto Eesti AS body works department; in the field of wholesale Tamro Eesti OÜ, Evelekt AS, Proplastik OÜ, Klavis OÜ (Vineerimaailm), Proplastik OÜ, Veho Eesti AS, Evelekt AS, BDP Eesti OÜ, Antalis AS, Makita OY Estonian branch, Exmet OÜ (Bermet), Laomaailm AS; in the field of logistics Havi Logistics OÜ; in the field retail COOP Eesti KÜ (Maksimarket), Bauhof Group AS, Rimi Eesti Food AS.